So I know last week I said I wouldn’t have much time to post recipes but after making these delicious treats there was definitely no way I couldn’t share them with you. With Easter happening and aisles and aisles of chocolate eggs, jelly beans and other tasty sweet treats my Digestive Clean Up challenge was well challenging. So I did some looking around and eventually concocted a treat that would satisfy my sweet tooth and not derail all of my effort over the past month. 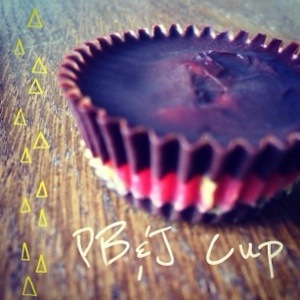 So here they are some tasty clean eats in the form of PB&J cacao cups. Makes approximately 10 minis or 5 large. 1. In a sauce pan melt coconut oil and stir in cacao and maple syrup. Melt slowly, there is no need to boil. 2. Line a muffin tin with paper or tin cupcake liners. If you have a silicon tray that will work great too and no liners will be required. 3. Take 1-2tsp of the coconut/cacao mixture and poor into muffin tin. Depending on the size of muffin tin you have selected you may need more or less. You just need to coat the bottle of each muffin liner with the mixture. Place in freezer for 15 minutes. 4. Once “chocolate” bottom is set add a dollop of PB and jam and cover with the remaining “chocolate”. Place in freezer for at least 2 hours. *maple syrup…I did put this in my recipe but upon reflection I wouldn’t do it again. The coconut oil has its own sweetness and it would have definitely been more than enough on its own. Also if you like dark chocolate you will be a happy camper. Note: the jam doesn’t have a load of sugar in it so it will freeze completely. I loved this however my husband wasn’t such a big fan. If you aren’t a fan of biting into something frozen place your treat in the freezer for 20 minutes before chowing down. Also the chocolate is made of coconut oil so it will melt quickly so don’t leave it out on the counter for too long. Well I hope you like these tasty little treats. And remember although they aren’t filled with processed sugars, preservatives and chemicals they are still treats so do your best to resist eating them all in one sitting. I found keeping them freezer where I wasn’t likely to look often helped with this. Happy Easter and have a great weekend everyone. This entry was posted in Food and tagged antioxidants, cacao, chia seed, clean eating, clean eats, natural, peanut butter by healingginger. Bookmark the permalink.